Locnville consists of twin brothers, Andrew Chaplin and Brian Chaplin who are indeed related to the late Charlie Chaplin. Although American born, the Chaplin's father is South African and they have lived in South Africa for the majority of their lives. Brian and Andrew discovered their passion for music at age 6 when they got their first guitars. The two started ?busking? around Cape Town and earned substantial funds from doing so, this lead to them recording their first single at age 8 titled ?Amnesia?, at which point it became clear that music was not only a passion but a life long career. Brian and Andrew discovered their passion for music at age 6 when they got their first guitars. The two started ?busking? around Cape Town and earned substantial funds from doing so, this lead to them recording their first single at age 8 titled ?Amnesia?, at which point it became clear that music was not only a passion but a life long career. From age 8 to 12, they were focused on a very rock influenced genre being that Brian played percussion and Andrew guitar. In 2001, the two moved to the States where they started to pick up a new taste of music, very influenced by Hip Hop. They later moved back to Cape Town, South Africa where they started to focus solely on Hip Hop music and the flow of rap. In 2005 at age 15, they performed at the 2005 Hip Hop Indaba in which they were the youngest contenders. They received unbelievable response during the event and afterwards. Andrew and Brian recall watching ?The Showbiz Report? on eTV and seeing themselves featured on the program of which they had no prior knowledge. Due to this, they contacted the station and got themselves a second insert on the program whilst in the process of recording their first Hip Hop demo entitled ?Making A Name For Us?. One track specifically, entitled ?What If I Said?, gained such popularity and momentum amongst the youth of Cape Town that it attracted the attention of award winning and acclaimed South African producer, Gabi Le Roux. Soon after this, they teamed up with Gabi Le Roux and R&B soul singer, Given Phike where the group and concept of ?III? was born. Their debut performance happened in Stellenbosch at a Tropika Pageant event and caught the attention of Mxit General Manager, Paul Stemmet. Following this, they became the first group ever to release their debut album on Mxit Music which exploded beyond expectation selling in excess of 500,000 units nationally earning them double platinum status. They have also taken part in music production with companies such as Kaleidosound Music Production, Contra-Banned and Mxit. 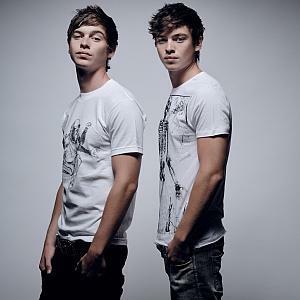 The two, having gained such success, have embarked on a new musical journey through Locnville and ContraBanned.com, which promises to be the most innovative form of online music distribution to date. Locnville brings a unique and uplifting message in their music which is beautifully complimented by smooth synths, heavy bass lines, upbeat and intricate percussion with lyrics sung in a smooth and melodic flow. Locnville has just released their debut album entitled ?Sun In My Pocket?, the music video for the singles ?Sun In My Pocket? & "6 Second Poison" are already in rotation on MTV, all SABC channels as well as 5fm, and the buzz surrounding Locnville is substantially increasing everyday.